I know. I know. 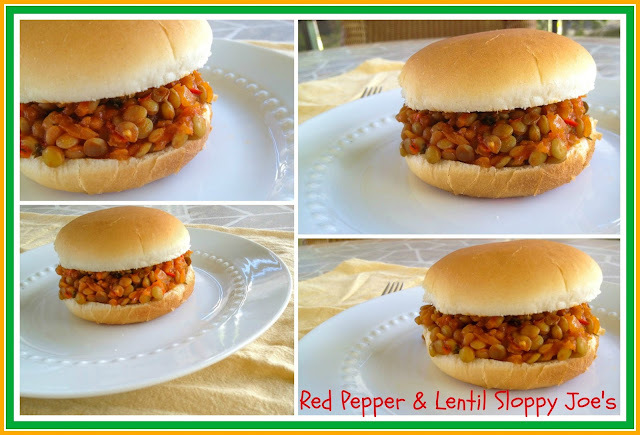 Lentil Sloppy Joes have been done a million times over, but these are the real deal. Sweet and spicy, with a little kick and a nice hint of garlic. They're perfect for any day, and they're super healthy for you. Add whatever spices to taste. The cumin and paprika add different layers of flavor to this recipe, keeping it interesting and delicious. If you want a spicier sauce, add more hot sauce and cayenne. For a sweeter sauce, add more brown sugar. Also, I estimated on the salt, so feel free to add more if need-be. Though this recipe has a lot of ingredients, you should have most of them on-hand. You can sub the Dijon mustard for regular mustard if necessary, and you can probably omit the cumin (though I highly recommend using it). Other than that, I hope that everyone is having a great Monday. I'm pretty behind and probably should've waited to post this, but I'm procrastinating a little. Looks like school work is next for me. I have to finish a Professional Responsibility and a Torts outline for one of my classes, and I really should get started on my paper. I also need to clean my room. It's a cluttered mess at the moment (which is also hindering my productivity). Oh, and my resume. I really need to polish my resume a bit, but I just don't know what I want to do with it. Makes about 6 Sloppy Joes. Total Cook Time: about an hour, plus time for soaking the lentils. 1. Soak the lentils in water for at least an hour. Drain and rinse. 2. In a large saucepan, bring about 6 cups of water, 1 teaspoon of olive oil, 1 teaspoon of salt, and the lentils to a boil. Continue cooking the lentils until tender, about 20 to 25 minutes. 3. While the lentils are cooking, add the onions, red pepper, garlic, 2 teaspoons of olive oil, and 1 teaspoon of salt to a large skillet. Cook on medium-high heat until tender. Stir in the tomato paste, water, lemon juice, vinegar, cumin, paprika, cayenne, and hot sauce. Continue cooking for another 3 minutes or so. 4. Stir in the ketchup, Dijon mustard, brown sugar, buttery spread, and the parsley. Cook on medium-high heat until most of the water has reduced, 5 to 7 minutes. Reduce heat to low, cover, and let simmer for another 15 minutes or so, stirring occasionally. 5. Scoop about 1/2 cup of the lentil mixture onto each burger bun, and serve with a nice, big salad or fries. Not being American, I have never had sloppy joes :) So I love the look and sound of this recipe - it may need to be my first introduction to the dish! Sorry for my naivete, but I'm a newbie at vegan cooking (cooking in general). When do you add the lentils in to the mixture, and I'm assuming you drain the lentils first, correct?